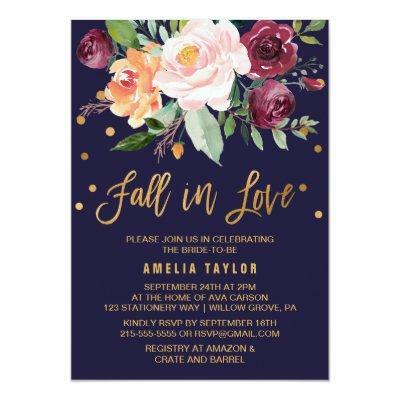 This autumn floral with wreath backing bridal shower invitation card is perfect for a fall bridal shower. The card reads "Fall in Love". The design features a stunning bouquet of blush, orange peach, and marsala burgundy flowers with faux gold foil typography and confetti. The backing features a gorgeous flower wreath which can be personalized with the name of the bride-to-be. Please Note: This design does not feature real gold foil. It is a high quality graphic made to look like gold foil.